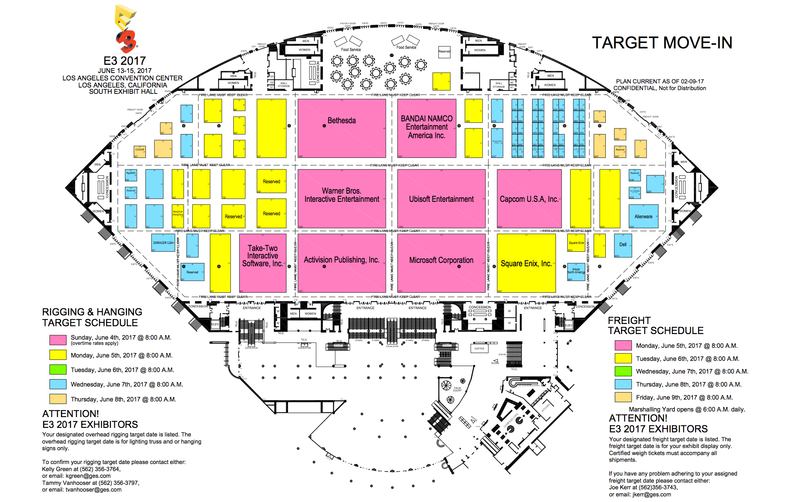 Floorplans for the E3 2017 gaming exposition in the Los Angeles Convention Center has surfaced online, and the reduced size of Microsoft’s gaming booth may cause some concern to gamers. E3 2017 is just a few months away and it should be an exciting time for gamers. The annual gaming exposition is the chance for publishers to tease, announce and reveal new gaming software and hardware. Just next week, Nintendo is releasing their new hybrid console – the Nintendo Switch – with a slightly empty launch lineup. Microsoft is also developing ‘Project Scorpio‘ which is promoted as “the most powerful console ever”. These two publishers alone have a lot to live up to in order to convince gamers that the Switch and Scorpio are worthwhile consoles to invest in. The 2017 floorplans however do seem to suggest that there will be a lack of playable Scorpio displays (if any) on the E3 floor. Microsoft’s gaming booth will be the smallest in comparison to Sony’s and Nintendo’s, as it’s just 150 ft x 100 ft, 15000 square ft. Their main competitor, Sony, will have a bigger than normal booth and a 37500 square ft total. Whilst Nintendo will demonstrate the Switch with a 32000 square ft total. Sony’s hands-on experiences will most likely promote new gaming software for the Playstation 4, Playstation 4 Pro and Playstation VR. Considering that they have the biggest square ft total out of Microsoft and Nintendo, they may have an interesting line-up prepared. Nintendo normally have a large amount of square ft within the E3 floor regardless, however this time they’re placed next to the Sony booths in the West Hall of the Los Angeles Convention Center, whilst Microsoft is at the South Hall. It is rumoured that Nintendo have also reserved the theatre too, which if true, could mean that Nintendo might announce even more new games coming for the Switch. Considering that the main must-have launch title for the Switch is only The Legend of Zelda: Breath of the Wild, newly announced original IPs and upcoming games will tackle doubts about the consoles line-up. Yet Microsoft’s smaller booth is quite interesting. While we can only speculate the reasons for it right now, it could signify that the Scorpio will either not be playable during E3 2017, or that there isn’t a huge line-up to advertise the power of the Scorpio. E3 2017 will take place at the Los Angeles Convention Center during June 13th -15th. More information about what the publishers have to offer will be teased closer to the date. For more news, keep updated with yBaX-PLAY.com. Prev Leaked footage of the Nintendo Switch’s operating system is uploaded.